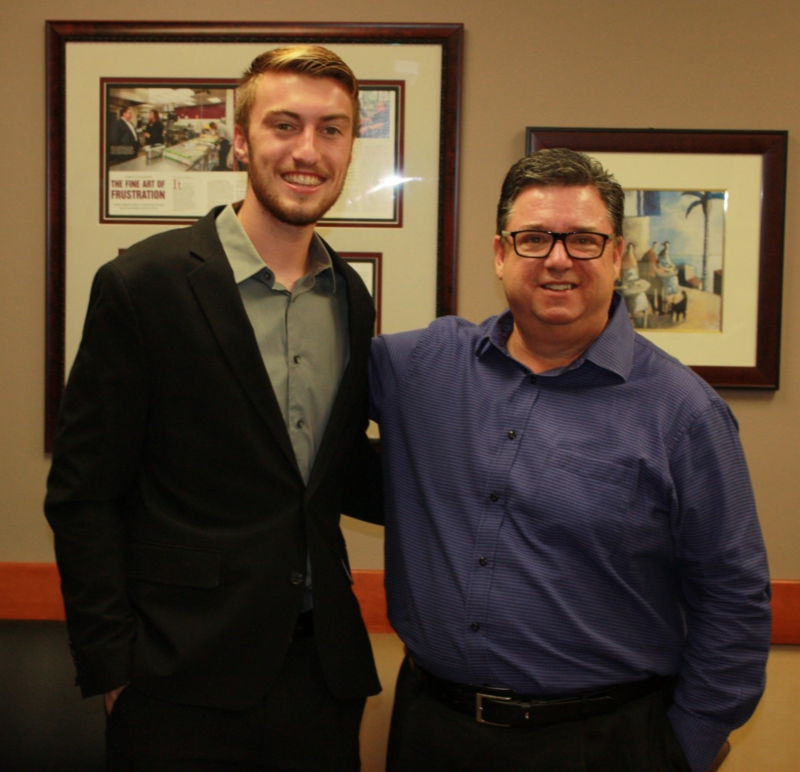 Tristan Starkweather (left), recipient of the 2018 Conrey Scholarship, poses with scholarship founder Jerry Conrey. The annual $3,500 award funds the entrepreneurship education and development of a Cal State Fullerton student. Jerry Conrey, agency principal of Tustin-based Conrey Insurance Brokers & Risk Managers, established the Conrey Scholarship, helping to fund the education of 14 Cal State Fullerton entrepreneurship students over the years. He discusses his passion for giving back and supporting the dreams of young professionals. When Jerry Conrey and his wife, Victoria Conrey, an Orange County physician, look for potential recipients of their $3,500 scholarship, academic excellence is one of the factors, but it isn’t the only criteria for the Orange County couple. Recalling his days as a Cal State Fullerton finance and political science student balancing education, employment and campus involvement, Jerry seeks to support students who have demonstrated acumen in both the philosophical and practical side of learning and personal development. The Conrey Scholarship is awarded to entrepreneurial students who are in good academic standing; plan to graduate the following May; and are working, interning or significantly involved in the campus or community. Most recently, the Conrey Scholarship benefited Tristan Starkweather ’19 (entrepreneurship), who was selected for his continuous involvement in Cal State Fullerton since his freshman days, as well as his commitment to work-school balance and supporting others. Jerry says among the most personally rewarding aspects of his scholarship are the connections he has forged with the students, who have all stayed in touch with him years after receiving their awards. 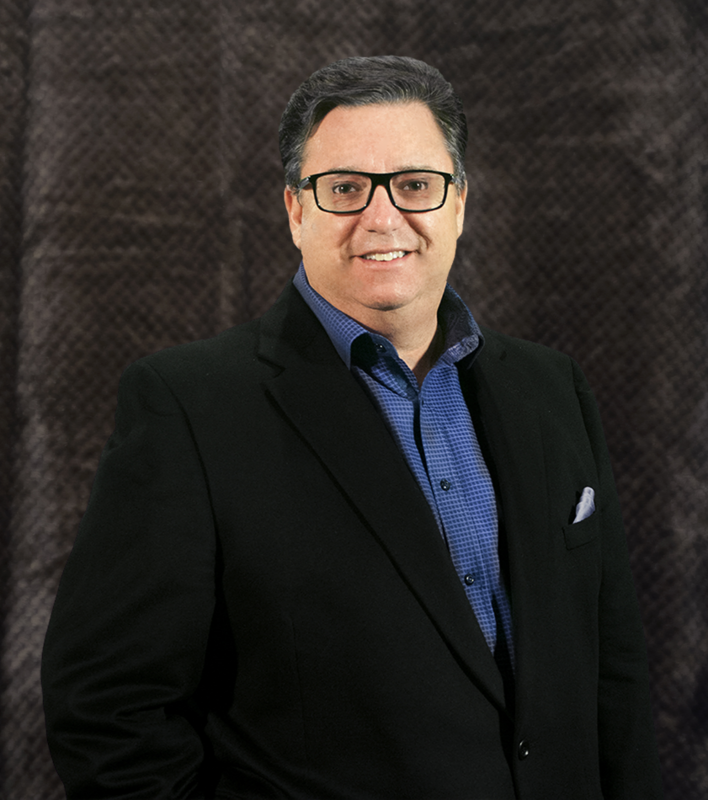 In 2002, Jerry purchased the agency now known as Conrey Insurance Brokers, which serves some 3,500 clients. Cal State Fullerton business students have been involved from the inception. Since 2003, Jerry has been a resident mentor of Cal State Fullerton’s entrepreneurship program, which now sponsors the CSUF Startup Incubator in Placentia and Irvine. For the 55-year-old, the university’s program for entrepreneurial students is particularly impactful because it combines practicality with academic scholarship and visionary innovation. Jerry says the education imparted through the Small Business Institute (SBI) – the applied academic component of Cal State Fullerton’s Center for Entrepreneurship – has been invaluable to students and his insurance business, noting that working with millennials adept at the latest technological platforms has resulted in his brokerage using tools such as Doodle and Google Docs to create better efficiencies. Since 1991, the CSUF SBI has achieved 11 national championship titles in the nationwide Consulting Project of the Year Competition and has ranked among the top 10 teams on more than 30 occasions. Noting that students are competing against such venerable public and private institutions as USC and UCLA, Jerry sees these accolades as emblematic of the applied education offered by the program. Though Jerry did not complete his undergraduate degree at Cal State Fullerton because he was recruited for a career position at Farmers Insurance Group, he considers himself an alumnus at heart and believes his student experience has been pivotal to his professional development. In the 1980s, he was active in Associated Students Inc. (ASI), the university’s official student government, as a four-term member of the board of directors and served as its vice chair twice and chaired ASI’s Finance Committee. Staying focused on a predetermined goal or vision is his advice to students for staying focused on a timely graduation and optimal entrance into the professional world. Reflecting on his recognition with the Conrey Scholarship, Starkweather says the award will pay both personal and professional dividends. “I was ecstatic about receiving this scholarship. I’ve always had to work for what I had, so it was really nice monetarily that I will be getting some help there. I won’t have to worry as much about working this coming year, knowing that I will have this money during the next semester. That was very refreshing and relieving,” he says. Starkweather says earning the scholarship has awakened him to the many opportunities offered through the Center for Entrepreneurship, such as the CSUF Startup Competition. With a strong desire to finish his undergraduate degree next year, fulfilling a personal goal to finish in four, Starkweather hopes that a strong connection with his mentor will be impactful to his professional development during the upcoming academic year. For more on the Mihaylo College Center for Entrepreneurship, which supports business startup education for students and the broader Orange County community, visit them online or at SGMH 3280. More information on the Conrey Scholarship and other scholarships for aspiring entrepreneurs can be found on the center’s scholarship page.